Just when I thought I was out, they pull me back in! I could apply that quote to the Mayo Advertiser asking me to return for a one-off All-Ireland final article or to Mayo football itself. Either way, I am delighted to be in this position in mid-September. As ardent football fans we have been deservedly rewarded in this county. Supporters have fed off our team’s energy and vice versa. That relationship is an essential component for a successful season so do what you can to make it to Dublin this weekend and bring the colour, bring the noise. When the 66-year drought ends this Sunday and the pent-up euphoria is unleashed with little hope of abating, my one concern is that the names of the men who built a football-loving county and laid the foundations for thousands of fanatics and players may be lost in the many celebratory renditions of The Green and Red of Mayo. We will all remember the triumphant Mayo panel of 2017, but what of the heroes gone before? What of the men who inspired our current players? And there have been many. Take any two Mayo fans and they will debate to stalemate who were the county’s best footballers of the modern age, which, for argument’s and brevity’s sake, I will define as the period from Mayo’s National Football League (NFL ) win of 1970 to the careers of the most senior members of the present panel. Well, thankfully there is a system in place that has decided it for us, in part. I say in part as not every great player received an All Star Award. But the All Star Awards have gone some way to officially recognising the outstanding players from the football championship each year since their inaugural year in 1971. The scheme to honour GAA players originated amongst journalists early in 1971 during a seven-a-side championship being sponsored by tobacco company, Carroll & Co. Carroll’s officials believed that along with the obvious upshot of attaching itself to the GAA brand, the awards would give recognition to great players who did not win a provincial or national title. The awards were no gimmick and would have to be earned as the stringent selection process indicates. Initially players for each of the 15 positions on the hurling and football teams would be made by a nomination panel, which consisted of 27 full-time national journalists. The final selection of the award recipients was made from those nominations by a selection committee composed of 11 journalists representing the Dublin newspapers, RTÉ, BBC and representatives from Cork and Belfast. The first football All Star Awards were announced in November, 1971. The sole Mayo man selected among the final 15 for that year was Johnny Carey. Carey had captained Mayo in the 1969-70 season when they won the NFL. Among Carey’s team mates in the 1970 NFL final were Joe Corcoran and Joe Langan. Both Corcoran and Langan (along with Séamus O’Connor ) were recipients of the All Stars’ predecessor, the Cú Chulainn Awards when they were last presented in 1967. In 1971, Mayo had exited the championship at the provincial semi-final stage for the second year in a row but had made the NFL final again only to lose to Kerry. It was enough to earn Carey the All Star Award for the right full back position out of nine nominations. The selection committee concluded that “the earnestness of spirit he [Carey] brought to his county team, his complete dependability in defence was as note-worthy in 1971 as in many previous seasons”. Mayo’s record in the championship and the NFL during the 1970s does not read well and was reflected in the All Stars awarded that decade. Johnny Carey’s success was not followed up by a Mayo player until Joe McGrath received his nod in 1979, ironically while under the managerial watch of Johnny Carey. To leave the 1970s on that comment would be grossly unfair because in the face of some uphill battles and mixed success men continued to train, continued to sacrifice, continued to wear the jersey and contest. Those men - the Tommy O’Malleys, the Willie McGees, the Ger Feeneys - persisted with the project when many would have abandoned it. Joe McGrath’s All Star Award in 1979 hinted at changing fortunes for the senior team. It certainly looked that way when Mayo made the All-Ireland semi-final in 1981. They lost to eventual champions Kerry, but that game will be remembered for Jimmy Burke’s pass to Eugene McHale for Mayo’s only goal and for the bursting energy of the 22-year-old Willie Joe Padden. Despite their 1981 championship run, Mayo received no All Star Awards that year. The hoped-for rise in riches that was fostered by the 1981 championship campaign was not followed with any concrete success in the NFL for the rest of the 1980s. 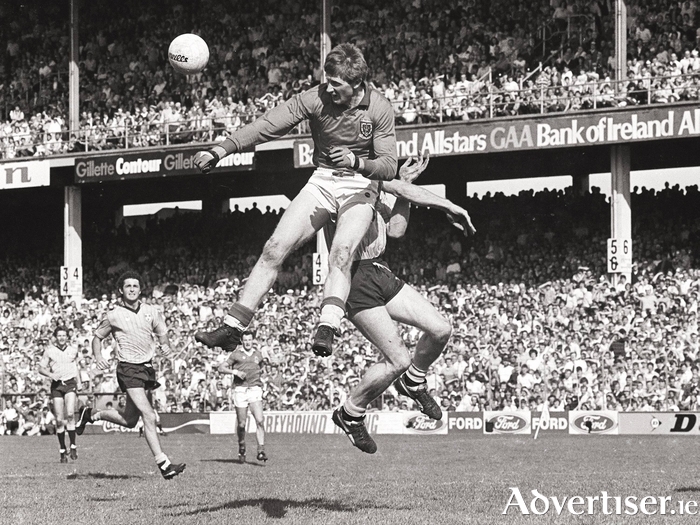 The drive for Sam dried up too until 1985 when, in an all too familiar scene nowadays, Dublin and Mayo had to slug it out twice at semi-final stage before the Boys in Blue finally gained their place in the final. The Connacht champions were rightfully awarded with All Star Awards that year for Dermot Flanagan, Willie Joe Padden and Kevin McStay. McStay finished that campaign as one of the competition’s top-scorers averaging almost 5 points a game. The period 1986 to 1989 may not have thrown up All Star Awards but a steady rise in Mayo’s overall championship performance deservedly led to a 1989 All-Ireland final against Cork. It was the Mayo senior team’s first championship final appearance in 38 years and my first final, having entered Croke Park as a hyper 11-year-old for the first time a month earlier to watch the semi-final against Tyrone with my father and twin brother. Those up-and-coming years were dotted with fine players that I will never forget: Anthony Finnerty, John ‘Jaw’ Finn, Frank Noone, Padraig Brogan, Martin Carney and so many more. By the time the 1989 final was over, the Mayo squad had become household names, a fact cemented by the awarding of All Stars to Gabriel Irwin, Jimmy Browne, Noel Durkin and a second each for Dermot Flanagan and Willie Joe Padden. There was no accolade however for that year’s top scorer, Mayo’s Michael Fitzmaurice. After Mayo’s NFL final appearance at the end of the 1977-78 season, that competition took a back seat and the championship-focused county did not contest another league final until 2001. Under the old format, Connacht titles ensured an All-Ireland semi-final place for Mayo in 1992 and 1993. But despite the calibre of individuals on the panel, only T.J. Kilgallon (1992 ) and Kevin O’Neill (1993 ) picked up All Stars for those campaigns. The crushing one point final replay defeat to Meath in front of 65,800 supporters in 1996 was a particularly harsh blow for Mayo. Tellingly, Mayo picked up as many All Stars as the champions Meath when Kenneth Mortimer, Pat Holmes, James Nallen, Liam McHale and James Horan received due recognition for their talents. There was no award for Mayo’s Maurice Sheridan who finished as the 1996 championship’s top scorer. That panel’s mettle was again shown when within 12 months they were back in the All-Ireland final as Connacht champions. However, the All Star Awards for 1997 did not acknowledge what Mayo had achieved. After picking themselves up following the Meath replay, Mayo had to fight hard to beat Galway, Leitrim and Sligo to gain passage across the Shannon. Solid performances from P.J. Loftus, John Casey and 1995 Mayo Sports Star of the Year David Nestor were required to assist the team to their third September final in a row, including the previous year’s replay. A three point final win gave Kerry the lion’s share of the 1997 All Stars with one for Mayo’s Pat Fallon and a second for Kenneth Mortimer. Maurice Sheridan missed out on the 1997 top scorer honour by just one point. The dependable forward from Balla was contesting again in 1999, finishing second behind Armagh hot-shot Oisín McConville. During his relatively short eight-year senior career (short when compared to those of his contemporaries ), Sheridan notched up an impressive 1-105 and was a member of Pat Holmes’ 2001 NFL winning side, Mayo’s last league title. The team of the early 2000s was developing a strong forward line that included James Horan (who earned a second All Star in 1999 ), Ciarán McDonald and brothers, Trevor and Conor Mortimer. Mayo were back in the All-Ireland final in 2004 under manager and one-time senior player John Maughan. Maughan had the credentials. In his first Mayo managerial outing he had brought the team to the 1996 and 1997 All-Ireland finals. But as with those years, 2004 was not to be either. The aforementioned forward line produced an All Star in Ciarán McDonald but Conor Mortimer was unlucky not be included for his 1-42 total. Solid defender James Nallen picked up his second All Star. Like 2004, Mayo went into the 2006 All-Ireland final as Connacht champions. 2006 was to be James Nallen’s fifth unsuccessful final. In a decision driven by determination and ability, Nallen remained playing for another four years and called time on his 15 year senior career in 2010. For his efforts, Conor Mortimer received his only All Star in 2006, helped by his scintillating top score of 1-35. As the All Stars begin to include current Mayo panel members from this point on, 2006 is as good a year to halt. I will lid my pen for now on the careers of the current panel in anticipation of that one sweet line that only they can write.